We release trout and salmon into Victoria's public waterways generally between April and November each year. Most of these fish are released into lakes and impoundments where they provide enhanced recreational fishing opportunities for anglers. The annual regional consultative meetings (Vic Fish Stock) provide a forum for discussion on fish stocking regimes, fish population surveys and other related recreational fisheries management issues. To access the reports from 2005 - present see Vic Fish Stock reports. In many streams, trout fisheries are based on self-sustaining wild stocks. All aquatic organisms that are stocked into Inland waters must comply with the Protocols for the Translocation of Fish in Victorian Inland Public Waters. Between November and April each year, we stock native fish fingerlings. These fish average about one gram each. Snobs Creek breeds some Murray cod, trout cod and Macquarie perch for stocking and the rest of the fish required for stocking, such as golden perch, silver perch and additional Murray cod purchased from commercial fish growers. These species are native to the Murray-Darling Basin and are thus stocked north of the Great Dividing Range. More recently, selected lakes and streams in Gippsland have been stocked with Australian bass which are native to the coastal flowing streams east of Wilsons Promontory. 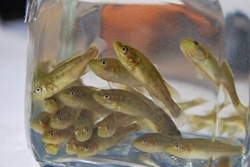 Estuary perch, a close relative of bass, have also been stocked in a number of coastal drainage waters in the state. View the fish stocking summary table. Marine stocking is being trialed in Victoria. In 2015 and 2016 Lake Tyers and Tamboon Inlet were stocked with Mulloway. Lake Tyers also received a stocking of estuary perch. Dr Matt Taylor from the University of New South Wales has completed an initial assessment of the feasibility of marine stocking in Victoria. The report outlines an assessment of twelve estuaries which may be suitable for future stocking consideration. Stocking fish in farm dams for personal use, such as recreational fishing, is a popular and rewarding pastime in Victoria. However, it is important to stock the appropriate species of fish for your area. Fish that are local to your area are more likely to survive and thrive in your dam. If you decide you would like to stock your farm dam, please visit the Fish in Farm Dams webpage.